SIR WILLIAM JARDINE Two Autograph Notes Signed on Publisher's Pamphlets. British (Scottish) naturalist, ornithologist and author. Two single-sheet pamphlets giving advance notice of new publications by Sir William Jardine. The first is annotated in his hand "Mr Hammond's name as a subscriber will oblige" and the second is annotated in his hand "Parts 1 to 6 for 1850 are ready. Mr Hammond's name as a subscriber will oblige". Both are signed by Jardine. 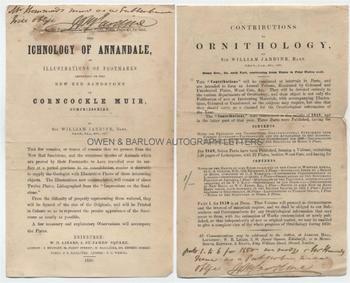 The pamphlets are publisher's 'flyers' advertising his forthcoming 'The Ichnology of Annandale' (1850) and 'Contributions to Ornithology' (1849-50). Each pamphlet measures approx. 8.75 x 5.5 inches. The first has a small hole at top left corner and there are slight mounting traces to verso. Some browning but generally very good. Sir William Jardine was one of the towering figures of Victorian natural history. He, perhaps more than any other person, was instrumental in bringing the study of natural history to a wide, popular readership and his name will always be associated with the 40 volume 'Naturalists Library' which appeared between 1833 and 1843. William Jardine was a formidable expert on ornithology and did much valuable work in this field. His correspondents included Alfred Russell Wallace and Charles Darwin.